Matthew 21 has been called the beginning of the end—the beginning of the end of Jesus’ earthly ministry. 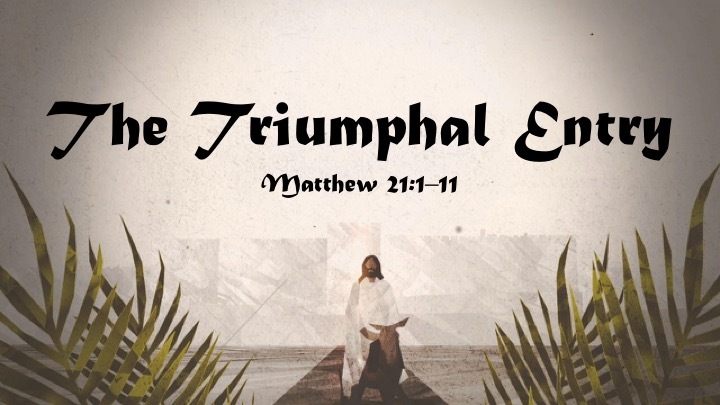 Here’s how Matthew 21 shows us that Jesus is the long-awaited King. There are three testimonials. First, we have the testimony of Jesus himself. During the Passover week, the population in Jerusalem would swell to 3 to 4 million people. It would have been an amazing sight—to see the number of religious pilgrims flooding into the city. But Jesus and his closest disciples would have only made up 13-people. In a crowd of 3- to 4-million people, by themselves they likely wouldn’t even have been noticed at all. But Jesus does something unusual. He does something that he’s never done before. Jesus sends two of his disciples ahead to fetch a donkey so that he can ride into the city on a donkey. But they’re not fetching the donkey because Jesus is tired of walking. Everywhere he’s gone in his earthly ministry, he’s walked. The average person didn’t ride an animal. That was reserved for rich people, or for people who couldn’t walk for themselves—like Mary when she was pregnant with Jesus. Jesus is asking for the donkey because he’s wanting to make a statement. He wants to stand out. He wants people to notice him—but not in a prideful kind of way. He’s making a statement about who he is. He’s wanting the people to see that he’s the king that they’ve been waiting for, but at the same time he’s going to show them that he’s not the king that they think they’ve been waiting for. Jesus is going to ride into town on a donkey, not on a warhorse. Jesus is going to come into town humbly. He’s going to come into town as someone who wants to save his people. But he’s not going to save them in the way they think they need saving. They think their coming King is going to drive the Romans out of the land. They think their coming King is going rule with force. But that’s not who Jesus is. Jesus is a servant King. He’s a savior King. He’s a humble King. He’s a gentle King. So, Jesus sends for a donkey. This is the first testimony that this Jesus is indeed the long-awaited King. The second testimony is the testimony of scripture. In verse 5, Matthew quotes the Old Testament prophet Zechariah. He quotes from Zechariah 9:9. Time won’t permit us to look at every verse in Zechariah’s prophecy, but I do want to focus on one quick idea in Zechariah’s prophesy. Rejoice greatly, O daughter of Zion! Shout aloud, O daughter of Jerusalem! on a colt, the foal of a donkey. “Behold, your king is coming to you.” The clear promise of scripture here is that a king is coming. 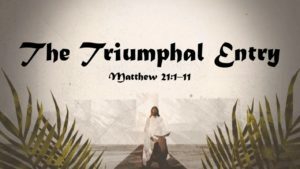 That Matthew, who is writing under the inspiration of the Holy Spirit, would use this passage in the context of Jesus coming into Jerusalem tells us that Jesus is this King. This isn’t Jesus making a big deal of himself. This is the testimony of scripture. Jesus is the long-awaited King. Third, we have the testimony of the people. A close reading of this passage shows us that there are three groups of people here. First, there are the two disciples in verse 7. Those two are the ones who return with the donkeys and they put their cloaks on the donkeys. Second, there’s the crowd that’s singing “Hosanna.” They’re described in verses 8 and 9 and 11. And third, there’s the crowd in Jerusalem. They’re the ones who don’t know what to make of Jesus. This group is described in verse 10. But that’s missing the point of what’s happening here. This second crowd, who are singing his praises, are some of the fellow pilgrims making their way into the city. They’re the ones, according to John’s Gospel, who were with Jesus when Jesus called Lazarus out of the tomb. The third group, on the other hand, the crowd in Jerusalem, are likely Jerusalem natives. According to Luke’s Gospel and John’s Gospel, they’re likely a part of the Pharisees. Here’s the point. Different people respond in different ways to Jesus. Some, who are familiar with the work that he’s done, see Jesus for who he really is, and as a result, they respond with praise and enthusiasm. They recognize him as the Son of David. They recognize him as the promised Davidic King. And they give everything to follow Jesus. These are pilgrims on a journey, and they give their very cloaks to honor their King. The cloak would have been the most valuable possession these pilgrims had with them. But please don’t underestimate their response. We may think that this second group got it wrong. Or at least we may want to tell them that they don’t have it all the way right. But what they’ve said is profound. They’re response that Jesus is prophet is a profound response. The Jewish people had been looking for a prophet ever since Moses. Moses promised the people that God would one day send another prophet to them. 15 “The LORD your God will raise up for you a prophet like me from among you, from your brothers—it is to him you shall listen— 16 just as you desired of the LORD your God at Horeb on the day of the assembly, when you said, ‘Let me not hear again the voice of the LORD my God or see this great fire any more, lest I die.’ 17 And the LORD said to me, ‘They are right in what they have spoken. 18 I will raise up for them a prophet like you from among their brothers. And I will put my words in his mouth, and he shall speak to them all that I command him. 19 And whoever will not listen to my words that he shall speak in my name, I myself will require it of him. Friends, Jesus is that prophet. Jesus is that long-awaited prophet. According to the book of Hebrews, Jesus is the better Moses. Jesus is greater than Moses (Heb 3). Listen to the testimony of scripture. This is Hebrews 3. 1 Therefore, holy brothers, you who share in a heavenly calling, consider Jesus, the apostle and high priest of our confession, 2 who was faithful to him who appointed him, just as Moses also was faithful in all God’s house. 3 For Jesus has been counted worthy of more glory than Moses. There were two testimonies given by the people. One was a testimony of faithfulness and belief. The other was a testimony of faithlessness and unbelief. Which testimony will you give Jesus today? In my last post, in light of Paul’s command to rejoice with those who rejoice and to weep with those who weep (Romans 12:15), we looked at 6 reasons Christians ought to rejoice. In this post, we will look at 3 reasons Christians ought to weep. First, we should weep over our own sin. In 1973, a psychiatrist named Karl Menninger wrote a provocative book titled, Whatever Became of Sin? In his book, Menninger argues that the idea or concept of sin has been slowly eroding away in our culture. Now, remember, this book was written in 1973. If we fast forward 45-years, we might want to call Menninger a prophet instead of a psychiatrist. We’ve lost our moral compass. We’ve lost the idea of sin—personal sin. We play the blame game. It’s not sin anymore; it’s just a mistake. And my “mistakes” aren’t really my fault. I do that because I had a bad home life growing up. I do that because everyone else is doing it. I do that because it feels good. I do that because I was just reacting to what this other person was doing to me. I do that because if I don’t look out for myself, no one else will. Each one of us can pick our own excuses, but we’ve lost our since of personal responsibility. I don’t write these things to minimize the devastation that can come out of a bad home life, but at some point, we need to look in the mirror and take personal responsibility for our sin. We need to be broken over our own sin. In Luke 7, Jesus had been invited to a certain Pharisee’s house to have dinner. And while Jesus is reclining at the dinner table, a certain woman from the community comes in and begins washing his feet with her tears. Luke records it this way. 38 and standing behind him at his feet, weeping, she began to wet his feet with her tears and wiped them with the hair of her head and kissed his feet and anointed them with the ointment. The larger story has many important lessons. but I want to ask this question. Why was the woman weeping? Why was she weeping? We know from the text that she was a notoriously sinful woman. Everyone in the room knew who she was. They knew of her reputation. Her reputation had preceded her. And I believe that gets to the heart of why she’s weeping. She’s broken over her own sin, and she’s found in Jesus someone who doesn’t condemn her in her sin. She’s weeping over her own sin. There’s a lesson there to be learned by all of us. Second, we should weep over the results of sin. It’s one thing to weep over our own sin, but it’s another thing to weep over the results of sin. Here, too, our culture has missed the mark. Right? We’ve all heard that before. It sounds simple enough. We might hear it and even be tempted to agree with it. But here’s the problem with it. All of our actions cause reactions. Everything we do has an effect on someone else. This is Newton’s third law of motion put into action in a cultural sense. Just in case you don’t know what Newton’s third law of motion is, this is what is says. For every action, there is an equal and opposite reaction. Now, I know, don’t send me any emails, I know that Newton was talking about physics when he said this. But I’m suggesting that this is also true in a cultural or moral sense. Whenever we decide to do what God has told us should not be done, there will invariably be negative consequences. God, who is the author of all things that are good, who isn’t the author of anything evil—when we violate his good and perfect laws, there will always be negative consequences. In other words, when we sin, it always has a negative consequence. This is a fundamental rule of how the universe is created. So, we should weep over sin, and we should weep over the results of sin. In 1 Corinthians 5, Paul is chastising the believers in Corinth because they aren’t weeping over the sin of one of their church members. 2 And you are arrogant! Ought you not rather to mourn? Let him who has done this be removed from among you. Without getting too far into the context of this passage, suffice it to say that this man was embroiled in sexual sin that even the pagans thought was out of bounds. The church in Corinth, however, thought they were being tolerant. They thought they were being loving. They wanted to look the other way. Paul said that was the worst thing they could do. Rather, they should have mourned over that man’s sins and the havoc it was creating in the community. Third, we should weep for those who reject Christ. The Bible is very clear in that there’s only one way that God has given us by which we can be put into a proper relationship with him, and that one way is through Jesus his Son. So, we should weep over those who reject Jesus. It should break our hearts. If we get a bad haircut, it’ll be better in just a few weeks. Don’t weep over a bad haircut. Hair grows back quickly. It will grow out and we’ll soon forget the bad haircut. If we land a bad job, we can get our resume ready, and with a little help, we’ll soon have new job. Don’t weep over a bad job. If we make some bad financial decisions and have to declare bankruptcy, even then, in just seven years, we can rebuild your credit. Don’t weep over that. But if we die after rejecting Jesus, we will spend an eternity in place where there is weeping and gnashing of teeth (Luke 13:28), and there will be no relief for us. Friends, this should cause all of us to weep for those who reject Christ. In Romans 12:15, the apostle Paul urges Christians to rejoice with those who rejoice, and to weep with those who weep. 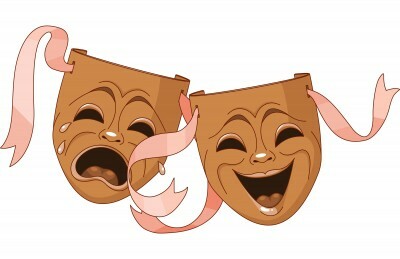 To rejoice is “to feel happiness or joy,” and to weep is “to cry aloud.” These words express emotion. Paul is urging us to have empathy for one another. If our brother or sister in Christ is rejoicing in God’s kindness to them, we ought to rejoice with them. If our brother or sister in Christ is weeping, we ought to weep with them. But this isn’t even a remotely controversial idea. After all, even our non-Christian co-workers will rejoice with you when you have a baby, and our non-Christian neighbors will weep with you when tragedy strikes your family. So, how are these two commands, “to rejoice with those who rejoice and to weep with those who weep,” how are these two commands distinctly Christian? Let’s ask ourselves these two questions. First, what are some things for which Christians should rejoice? And second, what are some things for which Christians ought to weep? Since the Word of God tells us that we should rejoice with those who rejoice and weep with those who weep, we should know when we should be rejoicing and when we should be weeping in the first place. First, we should rejoice when we face persecution for the cause of Christ. 10 “Blessed are those who are persecuted for righteousness’ sake, for theirs is the kingdom of heaven. 11 “Blessed are you when others revile you and persecute you and utter all kinds of evil against you falsely on my account. 12 Rejoice and be glad, for your reward is great in heaven, for so they persecuted the prophets who were before you. Most of us don’t like being the object of persecution. That’s not our default setting. Our default setting is that we like people to like us. We want to be likable people—at least most of us feel that way. But Jesus tells us that we’re to rejoice when we’re persecuted for righteousness. We’re to rejoice when people say all manner of things falsely against us on account of Jesus. We see this example carried out in the lives of the apostles. Early in the book of Acts, Peter and John and been put into jail for telling people about Jesus. When they got out of jail, this is what happened. So, we should rejoice when we suffer persecution for the cause of Christ. Second, we rejoice in the cross. A bit of cultural understanding is helpful and important here. When the writers of the New Testament mentioned a cross, none of them had on their mind a pretty piece of jewelry that was worn around one’s neck. That would have been the furthest thing from their minds. The cross was a symbol of shame. It was a symbol of pain and suffering. It was a symbol of death. The cross wasn’t pretty, but as Christians, we rejoice in the cross, because it’s through the cross that we have life. It’s through the cross that God removes the penalty of our sin. It’s through the cross that our sin is covered in the righteousness of Christ. 8 But God shows his love for us in that while we were still sinners, Christ died for us. Jesus went to the cross. He went to the cross and he bled and he died to pay a penalty that we owed. And then his body was laid in a tomb. But his body didn’t stay in the tomb. On the third day, God the Father raised his Son, Jesus, from the dead and victory was declared over the curse of sin. If you believe this, you can have eternal life. If you turn from your sins and turn to Christ, you can have eternal life. And this is why Christians rejoice in the cross. Because it’s through the cross that Jesus bore our sin and gave us new life. Third, and closely related to the previous point, we rejoice when others embrace Christ. It’s one thing to rejoice in our own salvation, and, yes, that is something we ought to rejoice in. We ought to rejoice in our own salvation. But we should also rejoice when we see others embrace Christ. In Luke 15, Jesus tells a series of three parables. All of the parables have the same message—the central message is this. Rejoicing when what had been lost has now been found. In the first parable, a man has 100 sheep, but one of his sheep has gone astray. One of his sheep is lost. He searches everywhere for that one sheep, and when he finds it, he comes home and says this. In the second parable, a woman has 10 silver coins, but one of them is lost. She turns the house upside down to try and find the one coin that was lost. When she finds it, she says this. In the third parable, a man has two sons, and one of his sons goes astray. He lives a life of sin and rebellion. When he finally gets to the end of himself, he repents of his sin and returns to his father’s house. This is what the father had to say. 23 ‘And bring the fattened calf and kill it, and let us eat and celebrate. 24 For this my son was dead, and is alive again; he was lost, and is found.’ And they began to celebrate. It’s good and right to celebrate when someone turns from their sin and embraces Christ. Fourth, we rejoice in our sufferings. This is different than rejoicing in our persecutions. With persecutions, we’re referring to suffering specifically for the cause of Christ. Here, with sufferings, we’re just talking about any run of the mill sufferings. We’re talking about the suffering that comes to all of us because we live in a broken and sinful world. We should rejoice in those sufferings. Paul writes this in Romans 5. 1 Therefore, since we have been justified by faith, we have peace with God through our Lord Jesus Christ. 2 Through him we have also obtained access by faith into this grace in which we stand, and we rejoice in hope of the glory of God. 3 Not only that, but we rejoice in our sufferings, knowing that suffering produces endurance, 4 and endurance produces character, and character produces hope, 5 and hope does not put us to shame, because God’s love has been poured into our hearts through the Holy Spirit who has been given to us. In the middle of this broken and sinful world, we WILL experience sufferings. It’s not a matter of if. It’s a matter of when. Don’t listen to any false teacher who’ll tell you that by the word of your faith you can speak these sufferings out of your life. That’s neither biblical nor true. We WILL have sufferings in this world. But listen to this—this is important—our suffering in this world isn’t pointless. Our suffering isn’t pointless. God uses our sufferings for our good and for his glory. Our suffering produces endurance, which produced character, which produces hope in Christ. So, we rejoice in our sufferings. Fifth, we rejoice when someone walks in obedience to Christ. We rejoice when people repent of their sins and walk in obedience to Christ. Paul writes this in 2 Corinthians 7. 9 As it is, I rejoice, not because you were grieved, but because you were grieved into repenting. For you felt a godly grief, so that you suffered no loss through us. In this passage, Paul’s writing to Christians in the church at Corinth, and many of these Christians are living in a way that would bring shame on the gospel. So, Paul decides to write a harsh letter to them. He wants to confront them in their sin. And he does just that. Genuine repentance is a good and godly thing. It’s something we should rejoice over. It’s a good and godly thing to walk obediently in the truth. Sixth, and the final “rejoice,” we rejoice when the gospel is preached. In Philippians 1, there were some people who were preaching the gospel to make a name for themselves. In other words, they weren’t preaching the gospel for the correct reason, but they were preaching the gospel. Their gospel content was correct, but their hearts weren’t where they were supposed to be. So, what are we to make of that? Should we be happy that people are using the gospel to make a name for themselves? Now, let me be clear, this would be different than much of what we see on TV in America today. Many—not all—but many of today’s TV preachers preach for the wrong motivation AND then to top it off, they ALSO get the gospel wrong. Paul’s not talking about that. Paul’s addressing people who have the wrong heart motivation, but they have the gospel right. This is what Paul has to say about those people. 18 What then? Only that in every way, whether in pretense or in truth, Christ is proclaimed, and in that I rejoice. So, we too rejoice when the gospel is preached. These are 6 reasons Christians ought to rejoice, and we ought to rejoice with one another about these things. My next post will explain why Christians ought to weep.